Tom Daschle of South Dakota been an advocate for ethanol and other biofuels for over three decades, as both a U.S. representative and senator in the 1980s and 1990s, and continuing since then as an advisor, consultant and author on issues such as climate change, food security and renewable energy policy. As Founder and CEO of The Daschle Group, Daschle advises clients on economic, policy and political issues and remains passionate about renewable energy. 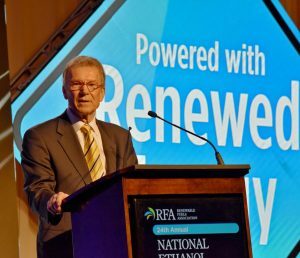 Speaking at the Renewable Fuels Association National Ethanol Conference in Orlando this week, Daschle talked about the incredible growth he has seen in the ethanol industry over the past three decades and the great respect he has for the people who have stayed the course and made it what it is today. Listen to Daschle’s address and interview with Agri-Pulse reporter Ben Nuelle below.